The first Force India was presented at Mumbai, India with a large media campaign to try to steal the hearts of the Indian people. 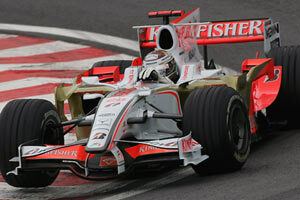 The VJM-01 would later on make its track debut at a test on 25 February at Barcelona. While the media campaign at the launch certainly worked, the performance throughout the season could not match what the team's principal expected beforehand. It wasn't however a failure for the team. With limited resources and being completely independent, a great job was done to improve the car with regular updates with both aerodynamic and mechanical changes. The most substantial aerodynamic upgrade came at Silverstone for GP09, and the introduction of the team's seamless gearbox was at GP12 in Valencia (Europe). Development of the VJM1 matched the rate of the leading teams, and was more rapid than the team's closest competitors meaning that the entire grid at the final race in Brazil was separated by little over 1s of lap time. As by the end of the season the team failed to score a point, team principal Vijay Mallya announced a major shuffle in the technical department and a new technical alliance with McLaren, hoping to get away from the last row on the grid.